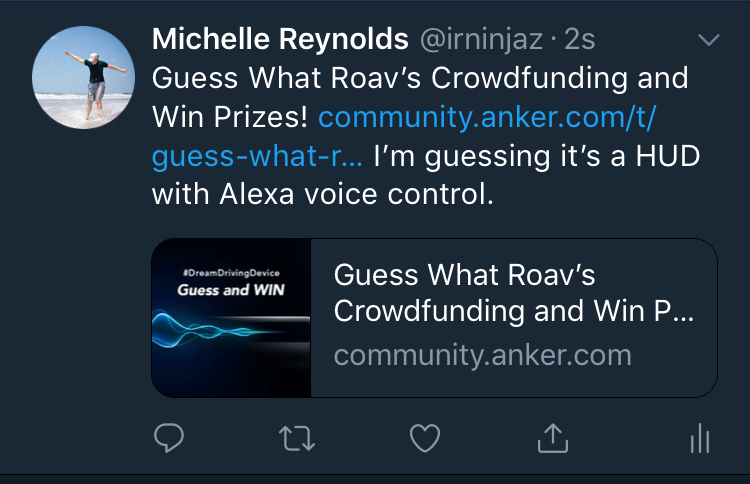 How many guesses do we get? Bugger, nothing for me to win. 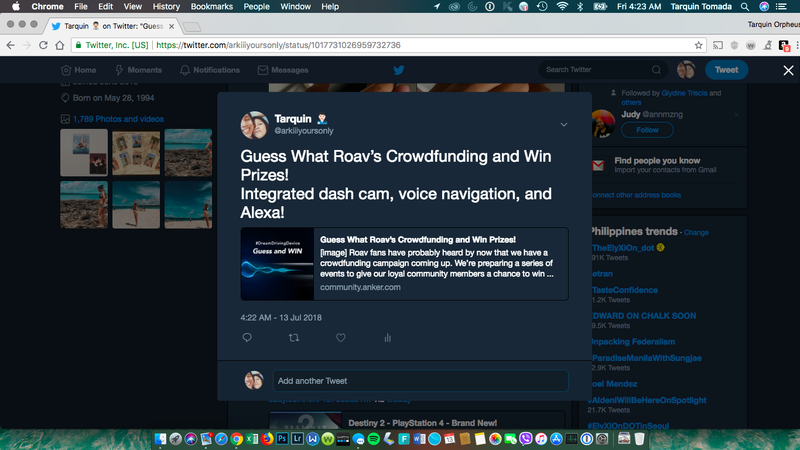 Integrated dash cam, voice navigation, and Alexa! 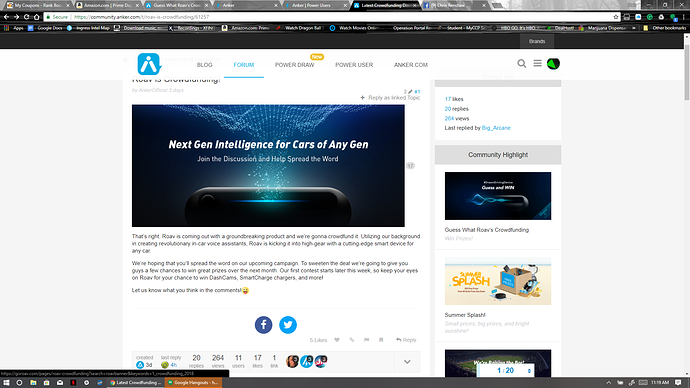 I think if @AnkerOfficial provides you with just a couple more pictures, you could write the entire campaign description for the project. Thanks for your analysis. The teaser looks really slick! I didn't want to look at any of the previous comments before guessing, but it looks like we're all kind of on the same page. An HUD would be great! Especially if it pulls from your maps service of choice like the Roav VIVA does. I wonder when we'll learn for sure what it is. July 19th? My guess it that's finally the Roav Dashtop HUD! It’s a HUD! it’s a GPS! NO! .... It’s an unbelievable, life changing, out of this world ROAV “thingamajig” that not even E.T. or the Jetson’s could have possibly imagined! 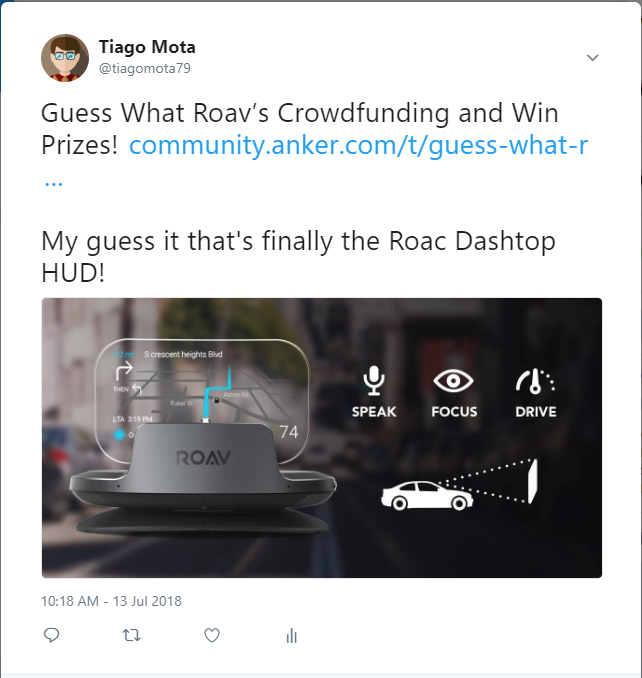 Roav’s new gadget sits on the dashboard, just below line of sight, and using high tech, super fancy, advanced augmented reality technology (its alright- back up, read that part again) and the help of a small projector, it broadcasts phone alerts, text messages, app notifications, map routes, music information, photos, and even details about the status of your car (ie speed, fuel, engine alerts, etc...) in a way that seems to appear in THIN AIR. And it does so ENTIRELY HANDS FREE, by your simple COMMAND. Okay, so no big deal. EVERYTHING is like that these days, right? This is just the same as every other “Alexa” enabled “smart” gadget out there, seriously. Oh, but it’s a hud. A smart hud. Let me pause for a second, slap myself right here and say: 1. NO- It is absolutely, positively, NOT. 2. Its Roav, therefore, It’s Anker, you fool! Utilizing some weird sort of space-age GESTURE technology, a front facing sensor, and the right or left wave of a finger, you can FULLY INTERACT with it. For all you codependent phone people (hey-that includes me!) 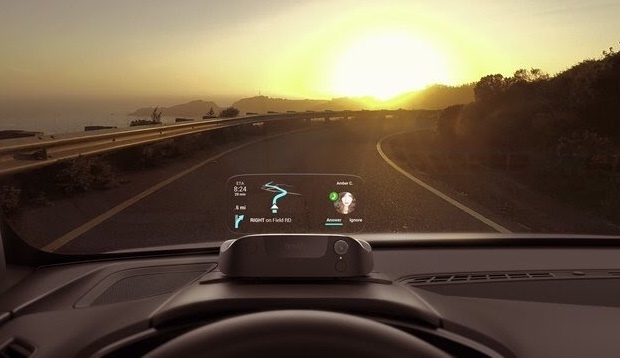 you can now drive AND have your life - at your literal fingertips, too! You heard me- at any time, a mere, single, finger flick or “hey you” away. Get directions and route information, share your eta, make and receive calls, read and respond to texts and app notifications, play music, ORDER PIZZA, and even order toilet paper if you wish (most likely depends on the pizza joint using gesture and/or voice recognition via Alexa, your phone, or an app on your phone. 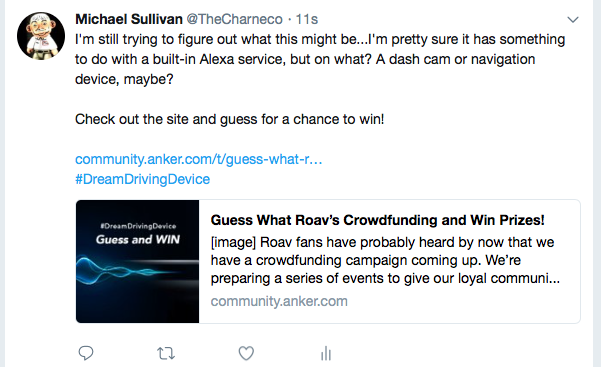 I honestly expect it to plug into your vehicle’s diagnostic port, via OBD with Bluetooth, making it able to provide speed, fuel, battery, and engine information. Heck - ASK it that stuff! Oh- and did I forget: It’s also an FM transmitter??? Dang!! All of that, and I might have only touched the surface of its capabilities! Either way, you just go on with it you little liberated free bird and speak your wish, wave/move your hand or finger, and your wish shall be granted (Mind you, to an appropriate degree, of course). Now, you might think that’s all there is, because seriously, what more could there POSSIBLY be?! Surely, that’s enough, isn’t it?! So you think you’re okay to stop ready here and move along (before noticing the very next sentence, thinking “can this be for real?! Or is she just crazzzzzy?!”). Bringing it yet another step further, I would almost bet it comes with a small dial for those linguistically challenged (especially handy for those like me, whom Alexa NEVER understands), that you attach to your steering wheel, allowing you to interact with and control the device using a way that is much easier for us simple minded and easily frustrated folk. HOW IN THIS WORLD, you ask???? Connect this bad boy via Bluetooth, AUX, FM transmitter, an OBD Bluetooth connection, Alexa, and my guess, even through Android Auto and/or CarPlay. Heck, go for it- all of the above if you really wanna! WOW. A bit overwhelming, isn’t it? Simmer down now and let all of that process a bit.... This isn’t something fresh and new, never before seen like you might think. No aliens were involved with, nor harmed in the making of this device. The difference is that it is from ROAV by ANKER, an industry leader, making a whole world of difference in quality and cost effectiveness. Needless to say, in sum and simply put: It’s magic, I tell you! Or genius! Or the work of an ethical and humane wanna-be Frankenstein creator! Or ALL THREE- Who really knows the difference anyway! Aside from that, the whole moral of this story is that it’s GOING TO BE AWESOME. I want one. And I want it now. 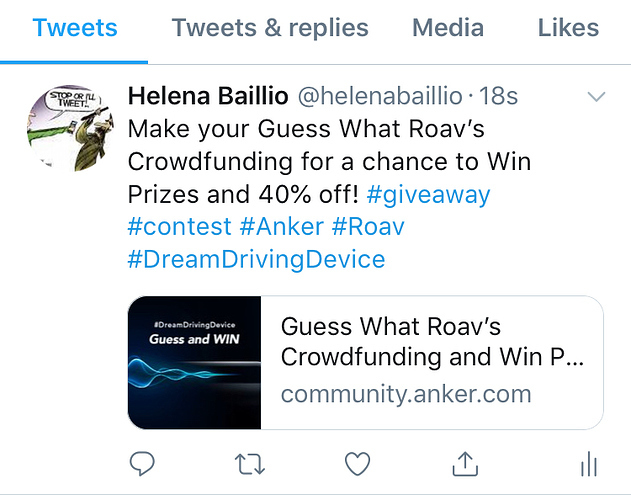 Don’t let me down @Anker @Roav -PLEASE let it be just this! I have come to expect nothing but the coolest, best, top of the game tech from y’all. 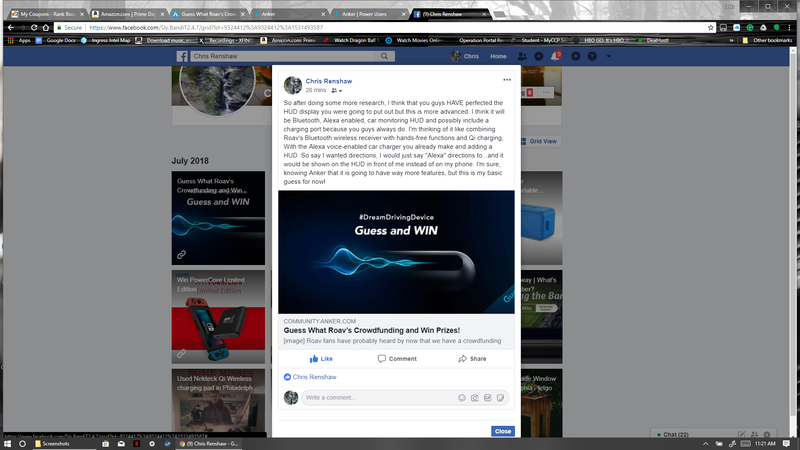 Plus, I put a heck of a lot of work into this Pre-half-witted-review of mine, hoping I nailed it If not, then WHAT are ya’ll waiting for?? Time to get on the bus already (uhhmmm.... royalties please )! p.s. 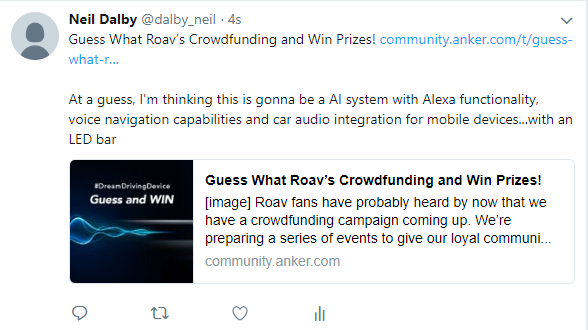 if someone posted my idea ahead of me, I blame spyware - and the fact it took me an hour or so to write! p.p.s. the included picture is, in theory, how I expect it will look and display. As for the picture itself, I snatched it from a dozen or more online, so here’s my disclaimer: it is not mine. Didn't they scrape their plans to make a HUD? No doubt this is the new and improved end result. I didn't want to say anything but I'm pretty sure u are right on, check this out i just found. HAHAHAHA! I loved everything about this.